Copying a Creator email is the same process as copying a HTML Editor email. Read the following article to find out how to do it! Select 'Add New Email'. This will bring up a new window. Select the 'GatorCreator' image. This will expand so you can enter more information. Add a name for your new email, preferably not the same as the original. Select an email to copy. It will bring up a list of all of your email creatives and allow you to pick one. Once complete, select 'Create New Email'. 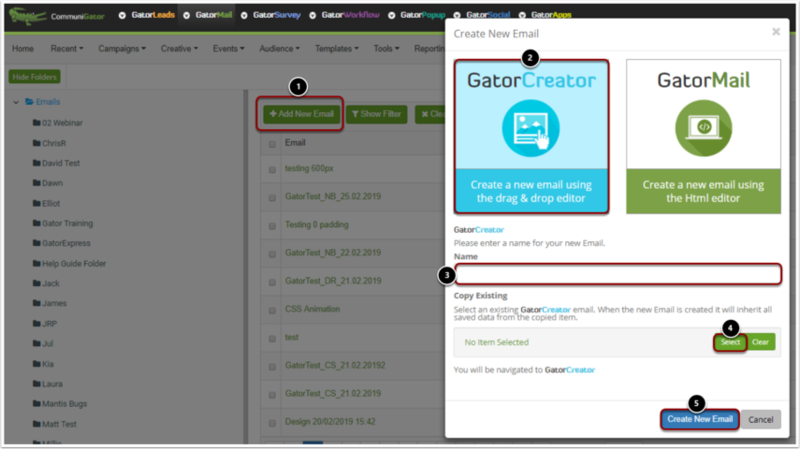 You will then be navigated to the GatorCreator Editor where you can make changes or simply 'Save and Close' your email.